AQUASAP is pure and 100% natural, and it's sustainably grown and harvested. When you buy AQUASAP, you're promoting sustainability, not only on your farm but also among the coastal villages of Tamil Nadu, India. Kappaphycus alvarezii (red brown algae) is cultivated on the shores there. The farmers have devised an ingeneous raft method for sustainable cultivation of this amazing seaweed. Rafts are constructed of bamboo, carefully hand-tied and strung with fishnet below the frame to prevent grazing by fish. Next, thousands of seed cuttings are prepared and tied onto rope creating seaweed strings which are then strung between the upper frame members of the raft. Once the web is fully strung, the raft is ready for cultivation and is floated into the ocean. During the growing process, the rafts are monitored daily for debris and other unwanted material which is continually removed from the raft in order to promote and maintain an optimal growing environment. 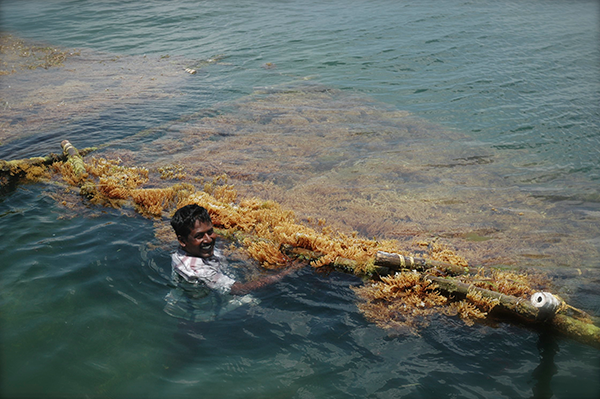 Once fully grown, the seaweed strings are removed from the raft and taken to shore where the seaweed is harvested and transported to the factory. The cultivation of seaweed in India has far-reaching and positive social, economic and environmental impacts. To start, it provides an alternative livelihood to fishing for the coastal poor and provides a way for them to improve their income and social status, thus improving their ability to provide for their families and their overall quality of life. In addition, seaweed cultivation affords many economic benefits such as continued generation of employment opportunities, especiallly for women, as well as access to financial resources not otherwise available to the coastal poor. Agriculturally, the availability of this amazing agricultural input in India is affording Indian farmers first-ever access to organic growth boosters at an affordable price. From an environmental perspective, the benefits are quite clear. Cultivation of seaweed plays a role in reducing acidification of the ocean which is one of the largest and deadliest threats to coral reefs. In this region, commercial growing and harvesting of seaweed has taught villagers the proper and sustainable way to harvest seaweed which is helping to eliminate destructive fishing and indescriminate harvesting, thus preserving nature. The seaweed farms also provide food for herbivorous animals, enhancing the ecosystem. Seaweed cultivation has created an alternative livelihood for the fishers while eradicating activities like destructive fishing and indiscriminate harvesting of commercially important naturally occurring weeds thus preserving the natural habitat. Copyright © SeaNutri LLC. (or its licensors) 2014. "Aquasap" (words and logo) are trade marks of SeaNutri LLC. All rights reserved.